You know those girls who gather up all their Christmas gifts on Boxing Day and head down to High Street or the nearest Mall to exchange everything for the items that they actually want? I have always been of the impression that those girls were not an example to emulate. A gift is a gift, and whenever possible we should enjoy and appreciate what we've been given, out of appreciation for the giver. Right? Right? 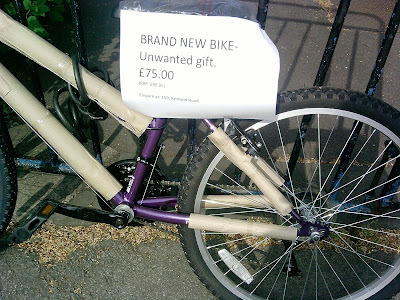 Perhaps by "gift" they meant it was a prize won on a tele challenge? Perhaps the person who gave it to them mail-ordered it from Timbuktu? Otherwise, what are the odds that the giver wouldn't see this sign? Actually, I assume the odds were quite high, or else it'd have been a bit too cheeky. BUT... what about a friend of the giver? Word could get back. Or what about a friend of the recipient? I'd be kind of embarassed for my friends to see me attempt something like that. Can honesty go too far? My sister-in-law ALWAYS returned gift given to her and my brother and their daughter. They wanted the cash. One day, over a couple drinks, she told me all about it. She told me she never liked my gifts and always returned them for cash. And it hurt. And I stopped giving them gifts. I didn't feel right at first, but then I got used to it. In fact, I really don't miss giving gifts to them at all. And, I don't mind that they stopped giving gifts to me, as well. Btw, we are still friends. It was all about the gifts. Weird, huh? btw, I LOVE that you say Boxing Day. That's a great story! I guess there's some culture in this world where that is the way things are done. What do you call it if not Boxing Day?